Nearly two years and 750 volunteer hours later, volunteers known as the “Hubsters” have assisted with archaeological fieldwork and the collection, cataloging, and analysis of diagnostic artifacts from the Hub, a National Register–eligible railroad logging camp where up to 400 people had lived and worked during the 1920s. Volunteers spent two seasons mapping numerous refuse concentrations consisting mostly of evaporated milk, sanitary, and No. 10 cans; bottle fragments, tobacco-tin clusters, 1920s auto parts, and a variety of rivets and buttons from clothing; domestic items such as tableware, china, and lamps; a headboard for a bed; and medicinal bottles, toys, and other personal items. We also located at least four possible privy sites and several food-storage cellar pits and observed circular shallow depressions and several raised mounds on flat terrain. Between sessions, we used an FS global positioning system (GPS) map of the Hub camp that enabled us to see spatial patterning of the features and concentrations such as where families and single men lived relative to the work area. 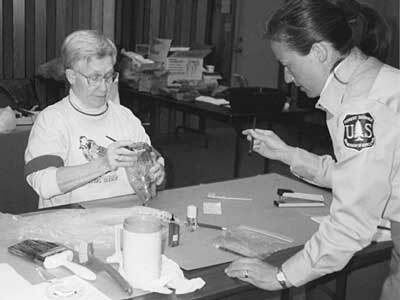 In April 1996 and 1997, volunteers meticulously cleaned, cataloged, and photographed the artifacts that had been collected. Analyzing the artifacts was not quite as easy as taking an item and finding the exact one with the manufacturer’s name and date in a single reference book! Through snow, rain, cold, and sunshine (yes, even in April!) and through work and play, laughter, and frustration, this was a time for the returning and new Hubsters to meet and share in the work to bring back life at the Hub. In the end, the volunteers experienced firsthand the difficulties associated with recording large surface scatter sites and the problems that land-managing agencies have with regard to protecting these significant sites. We were able to complete one of our tasks, which was to document the site in detail so that we could monitor potential disturbances such as vandalism and looting that might result from an interpretive auto/trail project. We kept artifact collection to a minimum and collected only diagnostic items to serve as points of reference for educational purposes. Lastly, we gathered additional information about the site and its inhabitants that can be used for interpretive brochures and exhibits for display cases. Thank you, Hubsters, for bringing life back to the Hub!